The late John Wark and Marcella Wark (née Mohr) were both Norka history enthusiasts. 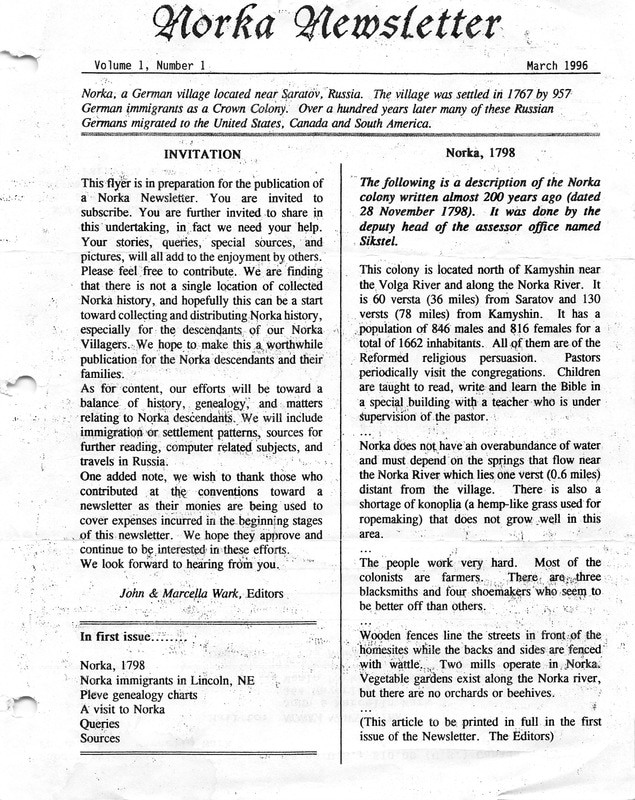 The Norka Newsletter was first published by the Wark's in 1996. The Wark's obtained the first copy of the 1767 Census (also known as the First Settlers List) after the collapse of the Soviet Union and arranged to have this document translated to English in 1998. This was a very challenging task given that German colonists spoke their names to Russian officials who recorded the sound of the name in Cyrillic script. The Cyrillic script was then translated into Latin script. The Wark's deserve credit and thanks for their pioneering work to locate and translate records related to the colonists of Norka. A flyer announcing the publication of the first Norka Newsletter in March 1996. Courtesy of Jerry Krieger. Jerry Krieger, Norka Newsletter Editor. Last updated January 28, 2017.